First wash and peel the yucca root. Remove all brown outer skin and the purplish under layer directly beneath the rough brown skin. Make sure your yucca is bright white and no purple layer or brown skin remain! Grate the the yucca until it resembles grated coconut. You can do this in a food processor. Put the grated yucca in a cheesecloth and squeeze all liquid until as dry as possible. Put the grated yucca in a heavy bottomed pot and add about 1/2 of the water and 1 tsp salt. Turn the heat up to medium or medium high heat depending on your stove top temperature. Stir this mixture constantly. This is very important because the yucca must NOT take on any color and must be stirred constantly to avoid any burning or coloring as this will ad an unwanted flavor to the dough. Continue to stir, approximately 15 mins. until the flakes come together and take on an opaque appearance and resemble a starchy dough. Add the remaining water as needed but do NOT make a runny or overly wet dough. The dough will be sticky but not wet. Remove from pot and allow to cool for about 15 minutes. While the dough cools, prepare your filling. Brown the ground beef in 1 tsp olive oil until all the pink is gone and drain thoroughly. You do not want a wet filling. Remove the ground beef and set aside. Place the onion, bell pepper, and garlic into a food processor and process until very smooth. Add the remaining teaspoon of olive oil to the pan and add your processed vegetables. Cook over medium heat until they are tender and translucent. Add the cooked ground beef, salt, pepper, crushed red pepper, ground cumin, ground coriander, and tomato paste. Cook until the tomato paste is well dispersed and fragrant, careful not to scorch the paste. Add the 2 tablespoons water, sugar and red wine vinegar. Continue to cook and stir until the liquids mostly evaporate and mixture looks relatively dry. At this point you can add your raisins, green olives and capers if using. Turn heat to low and allow to continue to dry while the raisins plump. Remove from the heat and add chopped hard boiled eggs, if desired. Use enough of the dough to form an approximately 2 to 3 inch ball (depends on how big you would like to make them) and pat down into a circle between two sheets of cling film plastic wrap that are brushed with some vegetable oil. The dough is very sticky and you can rub your hands with vegetable oil to prevent sticking also. Pat as thin as you can make them while allowing the filling to remain well encased! This is very important because if they are too thick they become gooey and starchy as opposed to a tender crisp shell. Make a disk and add as much filling as desired and carefully fold over and press to seal. Repeat until you make as many as you want. I honestly don't know if they can be filled and frozen or even if the dough will keep in the freezer or fridge because I have never tried. Fry in hot oil of choice, (I use canola and a cast iron skillet, I think it makes a difference). 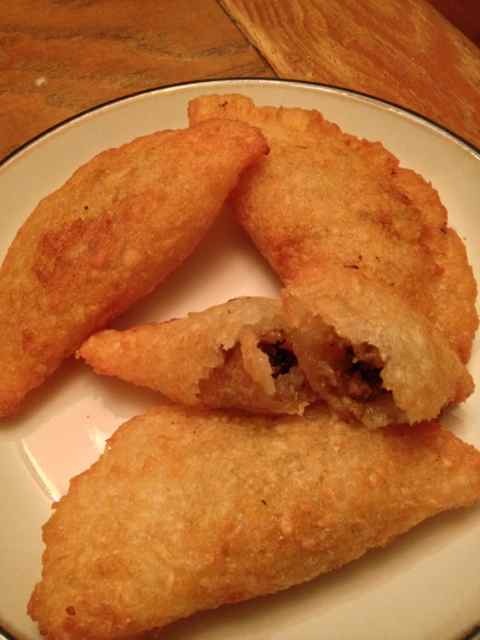 Yucca or tapioca empanadas are a crispy, gluten-free and delicious classic recipe from the Dominican Republic. 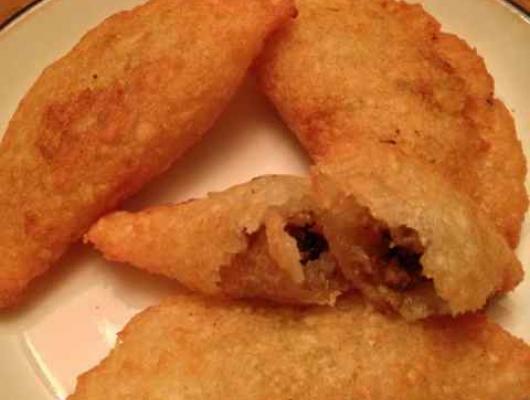 I believe they are called "catibias de yuca" in DR. Begin with fresh yucca root and a simple dough is made and these can be filled with anything you might enjoy. I made mine with a ground beef, although any filling you prefer like chicken, pork or veggies or even just plain unfilled discs are fantastic!